Red Bull has announced that Daniel Ricciardo and Max Verstappen will be conducing development work at this week’s Barcelona test. The Milton Keynes operation alongside Haas F1 are the only teams to select its current driver line-up for the two-day hit out which begins later today. 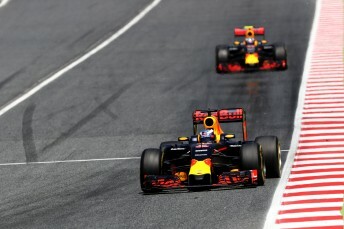 Ricciardo is set to begin the test while Spanish Grand Prix winner Verstappen will take over the RB12 for the final day. As a result, Red Bull and Haas F1 will have to field young development drivers on both days of the final in-season test at Silverstone to comply with the sporting regulations. World champion team Mercedes announced their driver line up prior to the Spanish Grand Prix along with McLaren, Renault, Williams, Haas F1 and Force India. Ferrari will kick off the test with Sebastian Vettel at the wheel before the four-time world champion hands over the duties to the team’s academy driver Antonio Fuoco. Meanwhile, Toro Rosso will welcome Red Bull junior Pierre Gasly who will share the car with Daniil Kvyat. Manor has elected to offer British GP2 driver Jordan King a drive during Wednesday’s running. Pascal Wehrlein will jump behind the wheel of the car for the opening day.